Camping is such a great way to spend more time with your family or friends, and there’s nothing quite like the great outdoors to help create a sense of adventure. No matter where you’re camping or what you’re doing during the day, being outdoors is always sure to help you work up an appetite. Camping is one of the greatest American past times – and the only way to cook is to heat up a grill in many cases. Sometimes, however, the weather isn’t conducive to lighting up a fire or struggling with a charcoal grill. When you’re battling 100-degree temperatures, and the woods are dry, some parks will put a ban on grilling entirely. And of course, if you’re in rainy weather, it’s not usually possible to get a flame that’s good enough to cook a meal for four. This is why it’s so important to bring an electric grill for backup when you plan on cooking in the great outdoors. In fact, many campers find that this is how they prefer to eat. There are a lot of benefits to using electric grill, whether you’re camping or eating at home. Not all of us have the desire to eat hot dogs and hamburgers day in and day out, and many people now have to watch our diets for fat and grease. An electric grill is designed in a way that lets the fat drip right off of the food you’re cooking, whether it’s a burger, steak or a cut of Halibut. You can get your power from battery sources and not rely on having good weather, which makes it ideal if you’re really into the rugged lifestyle when you’re in the great outdoors. Think of it as your secret luxury, and enjoy it just like you can enjoy an electric grill in the comfort of your own home. Electric grills take a lot less time to cook food than a regular grill – they tend to heat up in less than 10 minutes, and because they cook on both sides, they cook about twice as fast as a gas or charcoal grill as well. Cleanup is also pretty simple – there’s a grease tray that catches the fat, and usually a few inner trays that can wash clean pretty easily and then wipe dry. No worrying about disposing of hot coal or ashes, just make sure you bring a few trash bags and a roll of paper towels to your campsite, and quickly seal anything with foodstuff on it once you’ve finished up your dinner. Once you’ve been grilling on an electric grill for a while, it will seem like second nature to create well-cooked, delicious and healthy meals in a small amount of time. Next, we’ll look at some of the top grills for camping. There are a lot of great grills for camping out there, but for the sake of brevity and promoting safety, we’re focusing on electric grills in this post. 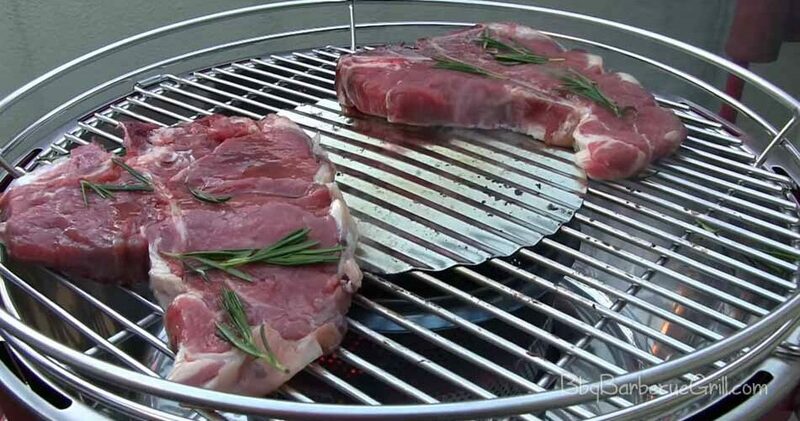 We’ll take a look at the best tabletop grills and the best electric grill for caravan cooking, as well as a few grills that plug in to the power supply provided by your camping aggregator. Socket power is often provided by the camping aggregator, campsite or other company managing the campgrounds, however, some campgrounds don’t provide any electricity at all, and you’d do best to choose a battery powered option and always travel with backup batteries on hand. Now that we’ve covered the basics, here are some of the best electric grills available for camping in 2018-2019. As always, do additional research and read more reviews before you invest your money, you’ll be glad you did. This great little camping electric grill has a smart, sleek design that’s mess-free and works well to take along on any camping trip, no matter where you end up during your adventures. It only weighs about 11 pounds, which means you can even stash it in your backpack when you’re out on a hike while your friends carry the cooler. The Lotus grill DOES use charcoal, but there is no fire hazard as the outer shell doesn’t warm up. You can also fit up to 4 steaks or burgers on this grill at once. When cooking indoors, such as a caravan, please remember to only cook in a well-ventilated space. The fan helps keep the smoke to a minimum. This camping electric grill is another great option that includes real charcoal without the fire hazard, and works well on a tabletop or countertop. This model boasts a 90% smoke reduction, making it safer to use in a caravan or kitchen if you so desire. The battery controlled fan helps control the airflow and keep the outer casing cool, and this model also features a handy carrying case so you can take it on the go almost anywhere. It weighs just a bit over 10 pounds. This lightweight champing electric grill model only weighs about eight pounds, and it’s nearly smokeless when it’s cooking. Touted as a tailgating grill, this grill can be considered the most portable and still has bragging rights when it comes to being smoke-free. However, because this grill uses about 4 charcoal briquettes and is meant for barbeque, it’s not going to be safe to use indoors no matter what you’re cooking. This Weber electric grill is a great tabletop grill for any outdoor cooking affair, with a 6 foot grounded cord if you have a power source to use it. It has temperature control and a lot of the bells and whistles you’d expect from a company that’s been in business since 1952. Although this is a great grill for camping, it’s not nearly as portable as some of the other selections because it weighs in at 42 pounds. It is great, however, for some advanced grilling methods such as searing and barbeque. Finally, there’s also a classic-shaped grill that is safe for both indoor and outdoor use, but it needs an outlet that is away from water sources and anything flammable to use safely. This Foreman electric grill is meant for a small crowd, and quickly became a favorite of tailgaters and campers because of its similarity to traditional charcoal grills. There’s no mess, and you can cook up to 15 hot dogs, hamburgers, or kabobs with no problem. It’s not portable enough to take on a hike, however, it’s great to throw in the back of your truck with the rest of your camping supplies. Now that you’ve learned about some of the best options on the market, choosing a grill for your next camping trip should be a breeze. Just know what you want and make sure you choose the grill that fits your camping style – such as a lightweight battery-powered grill if you love to go hiking and cook up some lunch. Looking for other grilling ideas? There are a lot of other cool ideas on this blog. Take your time to learn about the craft of grilling – you won’t regret it, and your friends and family with truly be impressed. And what will be the best electric grill for camping in 2020? If you are interested in this subject subscribe us and share your opinion in a comment. Thank you!